It has been rightly said that love is like a rumor, everyone talks about it, but no one truly knows. Though it is sublime, yet it is difficult to understand the antagonistic side of it. Often we end up having those people in our lives that are emotionally unavailable and are there for short term. They disappear leaving your heart sore and aching. 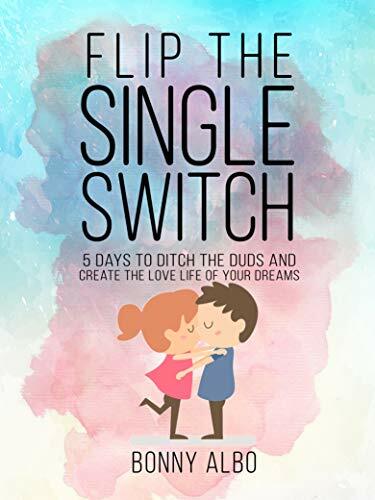 Bonny Albo, in her book ‘Flip the Single Switch’, deciphers the secret of finding the right partner by sharing five tricks with her readers. With an interactive narrative and to-the-point instructions, the author succeeds in grabbing the attention of the readers. The book gives a 5-day plan to kick start your dating life. Each day teaches you a tactic that will help you identify the right partners and prevent you from becoming a part of a failed relationship. Day 1: Dating diet- Resist the temptation of any sort- avoid contacting the prospects, feel good about yourself and be clear about what you actually need. Day 2: Tackling beliefs (why or why won’t you attract a good partner) and viewing them with a different perspective. Day 3: Understanding Radio Frequency and aligning it with your emotions. Emotions are to be taken into consideration only like how gut feeling comes into play. Day 4: Remind yourself of the time when you were confident. Focus on what you wanted and how good you felt. This day teaches a technique- more like a stimulus that will urge your brain to respond by making you confident in your actions. Day 5: Identify your interests. Figure out what draws you to your type of partners. The exercise prepares you to narrow down your options and think about the qualities that only become known once you have known the person for some time. Overall, I did not feel convinced with what the book had to offer. The tips are clichéd. Some of the exercises might work when doing it alone. But those exercises might fail miserably when you are at such a juncture where the time to analyze and think is very less. The points were laid before the readers in broad strokes and that is what did not help this book pass the muster.